[updated July 2012] Only a few of years ago the title of this blog would have seemed a contradiction, as we didn't know any veg*ns in the Middle East other than our friends in Israel. That has all changed now. The earliest reference we have in the IVU records is for a visit by the General Secretary to Israel in 1953 and over the next decade there were mentions of at least two veg groups there that were members of IVU. 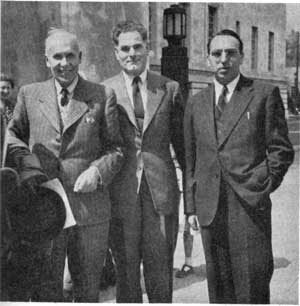 On the right of the photo is Mr. Philip Pick, later founder and first president of the International Jewish Vegetarian Society, with the (Christian) President and General Secretary of IVU in 1955. In the 1960s we have a mention of a vegetarian group in Iran, and an attempt to hold a veg congress in Israel, but all inevitably caught up in the political problems of the region. By the mid 1970s IVU had a system of Regional Secretaries for various parts of the world. Mr. Philip Pick (in the photo right), was appointed for the Middle East - despite the fact that both he and IJVS were, at that time, based in London. Mr. Pick remained in the role until he died, age 83, in 1993. Meanwhile, in 1990, there was another small Veg Congress in Israel, and another Israeli regional secretary for the Middle East was appointed, but by 1996 the IVU leaders seem to have finally realised that sadly Israel was never going to be a base for launching veg*ism across the region and the role lapsed. The Middle East was merged into the rest of IVU Asia for ten years, then in 2006 we found a remarkable new coordinator for India & SW Asia (ISWA) in Shankar Narayan, president of the Indian Vegan Society. Shankar had worked in Dubai for many years, so he was very familiar with that part of his region. 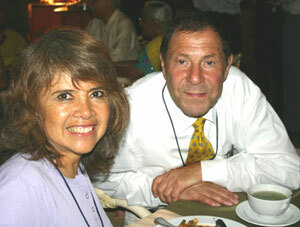 Meanwhile Dan Arbel joined the IVU Council for a few years, as president of the International Jewish Vegetarian Society now based in Jerusalem [right, Dan with a Spanish friend at the 2006 IVU Congress in Goa, India]. In 2006 the Vegetarian Union of Iran also joined IVU though contact has since been somewhat sporadic. Dan said he managed to keep in contact with some veg friends in Iran, though inevitably they had to keep their communications rather low profile. Our real breakthrough came in August 2008. Following the IVU Congress in Germany, Shankar stopped off in Dubai on his way home to India - on this visit he met up with Sandhya Prakash who had just begun to promote veg*ism there with a Middle East Veg Festival earlier that year. Sandhya was originally from India, but has been living in Saudi Arabia and Dubai for many years, often travelling to other parts of the region on business, and very much at home in the Arab/Muslim world. Shankar initially supported Sandhya by encouraging the IVU Council to agree a definition of 'Halal Vegetarian' for the IVU website. Halal simply means 'pure' and applies to a lot more than just the halal meat which attracts attention in the west. Now on the IVU website as: "a person or product complying with the generally accepted definitions of both Halal and Vegetarian." In October 2010 the Middle East connection was strengthened when Arash Rashidi from Iran gave a talk at the IVU Congress in Jakarta, Indonesia, and unexpectedly found five young men from Afghanistan in his front row [photo right]. They were all students in Jakarta, but now planning the first Afghan VegSoc when they get home. 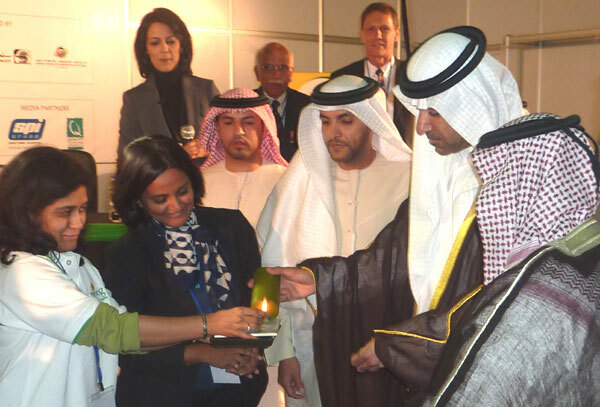 The culmination of all this came in December 2010 - at the first ever Middle East Veg Congress, again within MENOPE, at the Dubai International Convention Centre. This was a huge success, bringing individuals together from across the region, and generating a lot of publicity across the media. 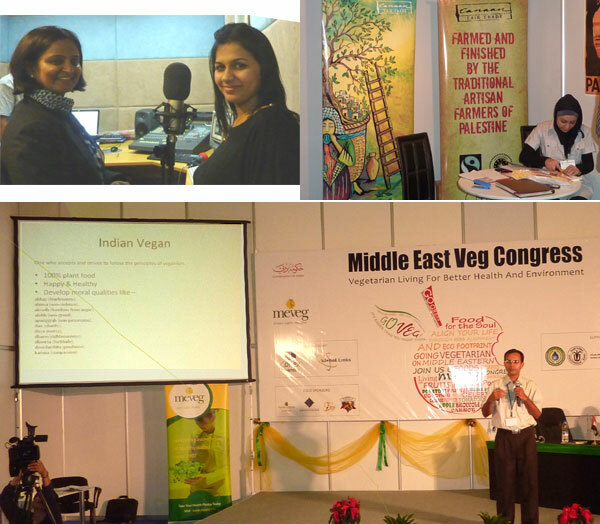 Below: Sandhya (on left of top left photo) giving an interview at a Dubai radio station during the congress; the Palestinian Farmers' stand at the adjacent organic expo; and Shankar Narayan giving a masterful lecture on the concept of 'Indian Vegan' -many vegans in the west could learn a lot from this. Thanks to Sandhya and her team we are now seeing veg activities in the Middle East that were unimaginable only a few of years ago. 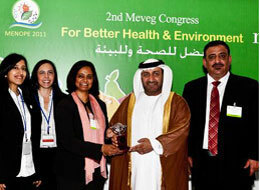 In 2011 they organised a 2nd Meveg Congress for the region (photo right), and there will be a 3rd Meveg Congress in December 2012. We’re also expecting an important visitor from Iran to the Health Expo, as part of the IVU Congress, in Los Angeles in October. The talk now is about holding the first ever IVU World Congress/Vegfest in the Middle East, with Dubai being the obvious location – watch this space…. There are Israeli businesses in Dubai, so we hope to have the whole of the Middle East represented. The Middle East peace process might even be a little smoother if vegetarians were running it, we just all want to be friends.